Knowing your customer and their journey has become essential to delivering customer engagement. Customer expectations are rising from personalised interactions and an experience that delights, the customer is empowered, and the modern brand needs to rise to the occasion. 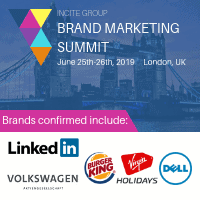 The Brand Marketing Summit (25th-26th June, London) is the must-attend event for those looking to reinvent their marketing and engage their customers. The future of marketing depends on possessing a deep understanding of your customer’s needs and providing them with the right interactions, at the right time. Lead the conversation at this year’s Brand Marketing Summit Europe. Register for The Brand Marketing Summit Now!! Why Brand Marketing Summit West is Important for Marketers?